Los árboles fueron motivo de una ceremonia muy especial. Con todos los honores hindúes, himnos, danzas y un banquete, se celebró la boda de estos árboles. El motivo es concientizar a la población. “La gente comenzó a cortar árboles que habían sido plantados para crear conciencia, los miembros de estos grupos de voluntarios se han esforzado para pedirnos que dejemos de cortar árboles. Hoy, hemos hecho un juramento: no dejaremos que corten cualquier tipo de árbol o planta”, comentó Harapriya Barik, residente del lugar. El Peepal y el Banyan, es decir, el novio y la novia, son árboles con fuerte presencia y relevancia en la mitología hindú y su boda es considerada igual a la realización del "Yagna" o los rituales de fuego santos. In the nineteenth century over two million Indians were lured away to work as indentured labourers on the sugar estates of the Caribbean, Mauritius, Fiji and other parts of the Empire. They brought the peepal tree with them and planted it in these new environments, a sign of their commitment to their cultural roots. Peepal Tree Press is the home of challenging and inspiring literature from the Caribbean and Black Britain. Its books express the popular resources of transplanted and transforming cultures. A banyan is a fig that starts its life as an epiphyte when its seeds germinate in the cracks and crevices on a host tree (or on structures like buildings and bridges). 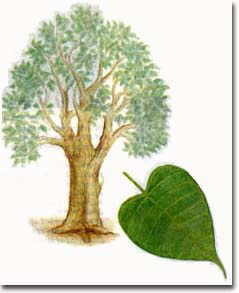 "Banyan" often refers specifically to the species Ficus benghalensis, though the term has been generalized to include all figs that share a unique life cycle. The seeds of banyans are dispersed by fruit-eating birds. The seeds germinate and send down roots towards the ground, and may envelope part of the host tree of building structure with their roots, giving them the casual name of strangler fig. The "strangling" growth habit is found in number of tropical forest species, particularly of the genus Ficus, that compete for light. Any Ficus species showing this habit may be termed a strangler fig. Older banyan trees are characterized by their aerial prop roots which grow into thick woody trunks which, with age, can become indistinguishable from the main trunk. Old trees can spread out laterally using these prop roots to cover a wide area. The largest such tree is now found in Kolkata in India. One famous banyan tree was planted in 1873 in Lahaina's Courthouse Square in Hawai'i, and has grown to now cover two-thirds of an acre. ÁRBOLES PARA EL PLANETA TIERRA: PLANTACIÓN MASIVA DE ÁRBOLES EN TODO EL PLANETA , ADECUADOS SEGÚN EL CLIMA EN EL QUE SE ASIENTEN. MIL MILLONES DE ÁRBOLES, SOBRE TODO EN ÁFRICA EN EL EL HEMISFERIO SUR. PARA COMBATIR LA DEFORESTACIÓN. LA IMPORTANCIA DE LOS ÁRBOLES PARA LA VIDA EN LA TIERRA.